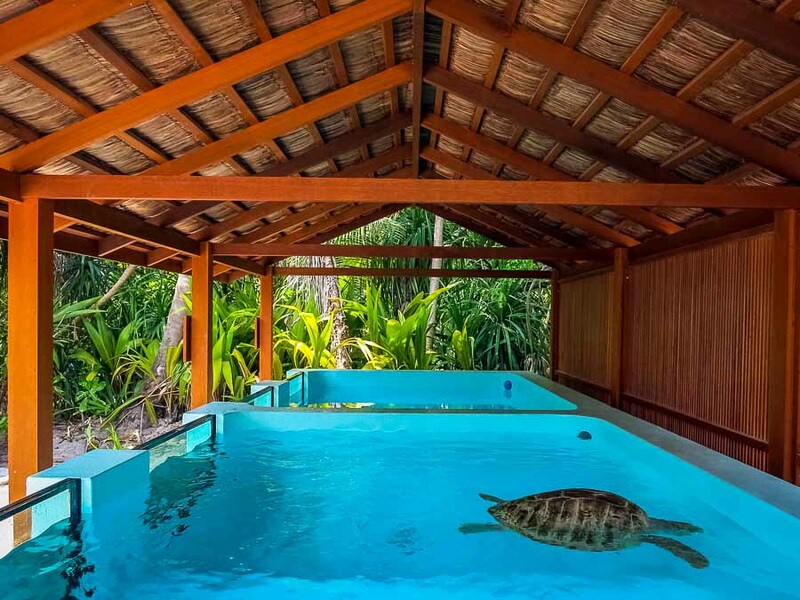 We currently have six Olive Ridley turtles in our rescue and rehabilitation centre, here at Four Seasons Resort, Landaa Giraavaru. Neurological problems, including the ear. Pneumonia (infection of the lung) or small tears to the lung. Accumulation of air in the coelom (body cavity), due to tears in the lung or severe trauma allowing air into the body cavity. 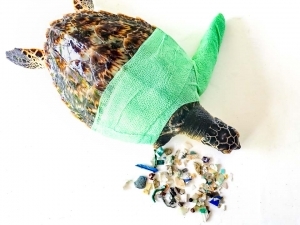 Trapped gas in the gastrointestinal tract, possibly due to (1) infection, (2) obstruction following ingestion of marine debris/plastic, (3) a build-up of shells from their normal diet, (4) gastrointestinal ileus. 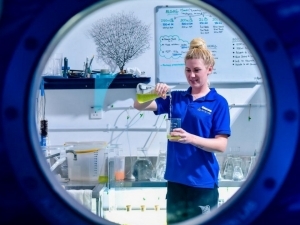 Previously we have performed simple surgery on our buoyant turtle patients, under guidance from professional marine veterinarians (at Florida’s Volusia Marine Science Center), in an attempt to release the accumulated air from their body cavities. We would use a syringe inserted in between the rear flippers and the plastron (shell underside) to successfully remove the air, sometimes several litres from one turtle in one procedure. 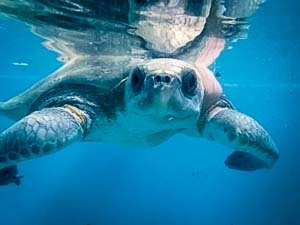 The turtles appeared not to suffer at all and some improvements were seen, but after repeating this procedure we found the beneficial effects to be short-lived, indicating the free-air is most likely due to small tears in the lung. 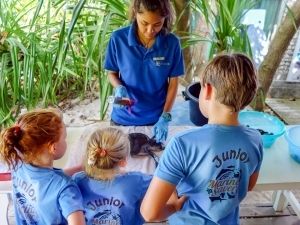 Upon admission, our turtles are fed a low-weight diet without shells or bones until we are certain their digestive system is properly functioning (feeding them a high-weight diet can cause further complications). Should the turtle not defecate, we can assume there is an intestinal blockage or ileus (lack of movement in the gastrointestinal tract). 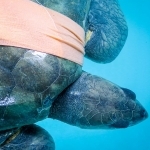 In these cases, the turtle is started on a treatment of milk thistle and Lactulose, a synthetic sugar used to treat constipation, moving food and any excess air through the digestive tract. 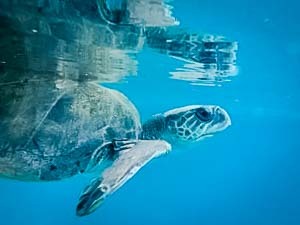 Turtles that have been entangled have most likely aspirated water during their struggle, which can lead to pneumonia. This is difficult to diagnose without radiographs, however we are able to observe tell-tale symptoms such as the turtle listing (leaning) to one side when floating, frequency of breathing, breath sounds, and breath smell. If the turtle presents with symptoms of pneumonia, they are started on wide spectrum antibiotics. Ossy: healthy and eating well, but no improvements in buoyancy. Zahiya: good appetite, but no improvements in buoyancy. 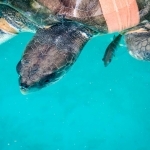 Elsa: unable to be released because of her missing flippers, but otherwise in good health. Peggy: still suffering from buoyancy syndrome, and carapace being treated with anti-bacterial cream. Kerry: very serious problem with buoyancy – unable to dive down, and floating to one side. Lefty: big improvements, and is now often sighted on the bottom of the pool. After continued treatment and care, she has largely recovered from various skin and carapace infections. We will start to increase her feeding portions to build up strength, and plan to release her during April. Meanwhile, over at Kuda Huraa we are also caring for two recently rescued Olive Ridley turtles (Lepidochelys olivacea), both found entangled in drifting ghost fishing nets. 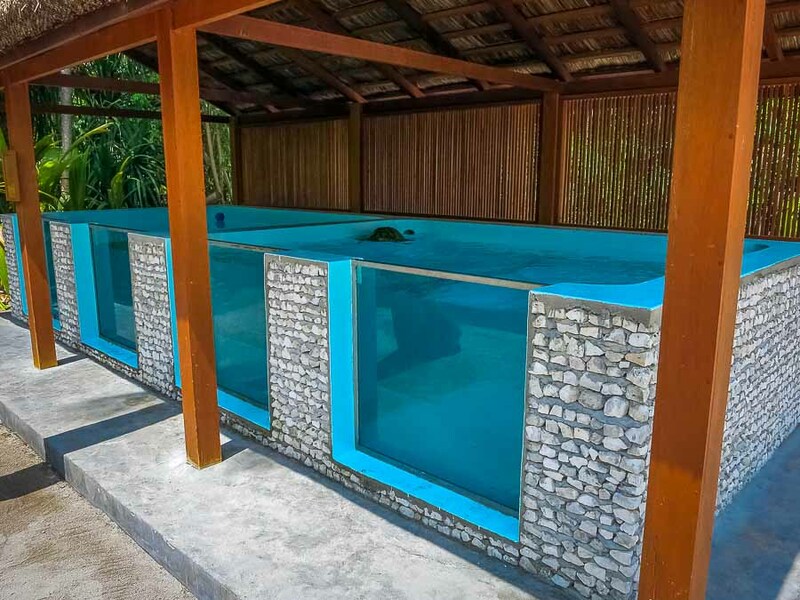 Shareefa (LO.058), rescued on 14 February by the transport team at Huvafen Fushi, continues to improve daily. 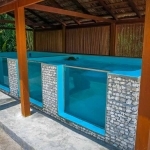 She is now able to dive to the bottom of her rehabilitation pool to eat fish and lobster, and the time spent swimming underwater is increasing. We are giving Lactulose in her food to treat suspected intestinal gas, as she is still positively buoyant. Daily Lactulose in food. Wound care twice a week; lacerations are flushed with diluted Betadine and Silveleb applied; carapace abrasion is cleaned with alcohol and Zylo-P/Silveleb applied. Dive time has increased. Turtle’s posterior is still positively buoyant when diving. Turtle is now eating a full diet daily. 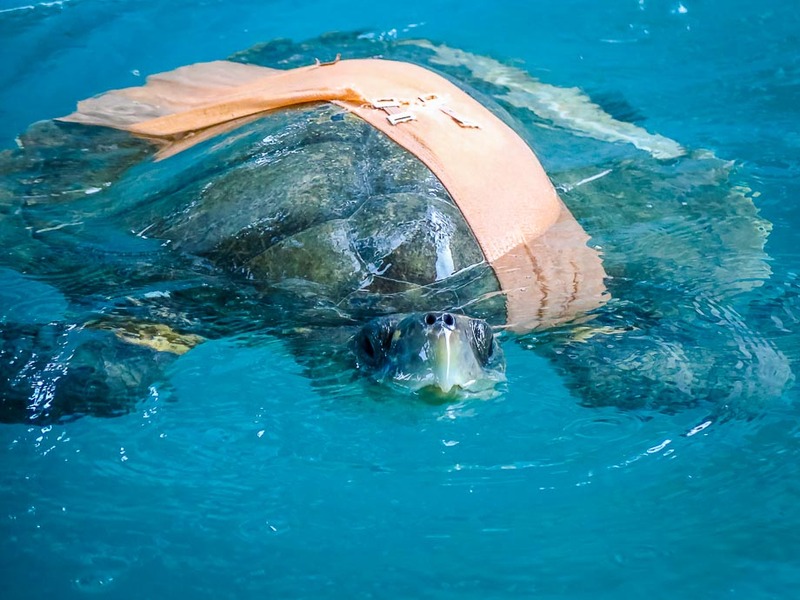 Maria (LO.059) was rescued on 28 February by the water sports team from Maalifushi by COMO. 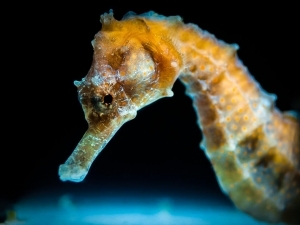 She has recently been moved into a deeper rehabilitation pool, but remains positively buoyant. 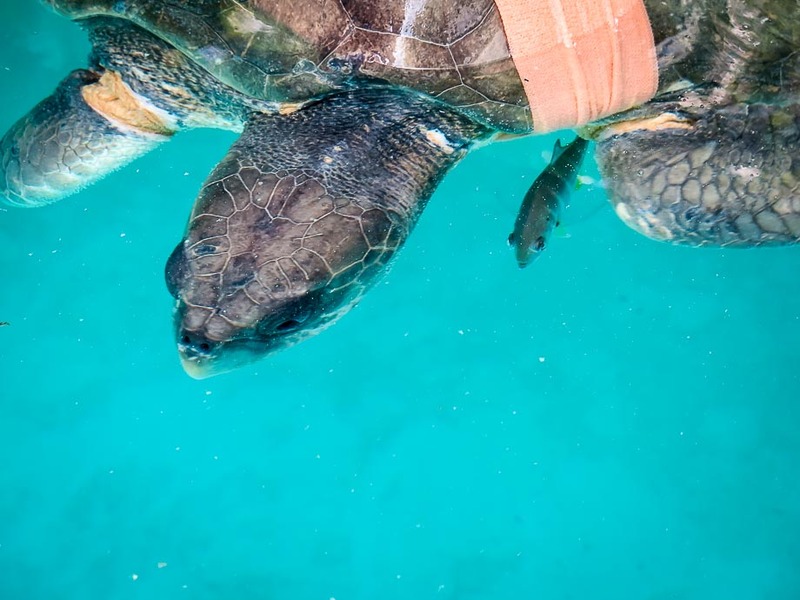 She continues to get daily wound care and antibiotics to combat any infection the turtle may have from her wounds, or a possible pneumonia infection. 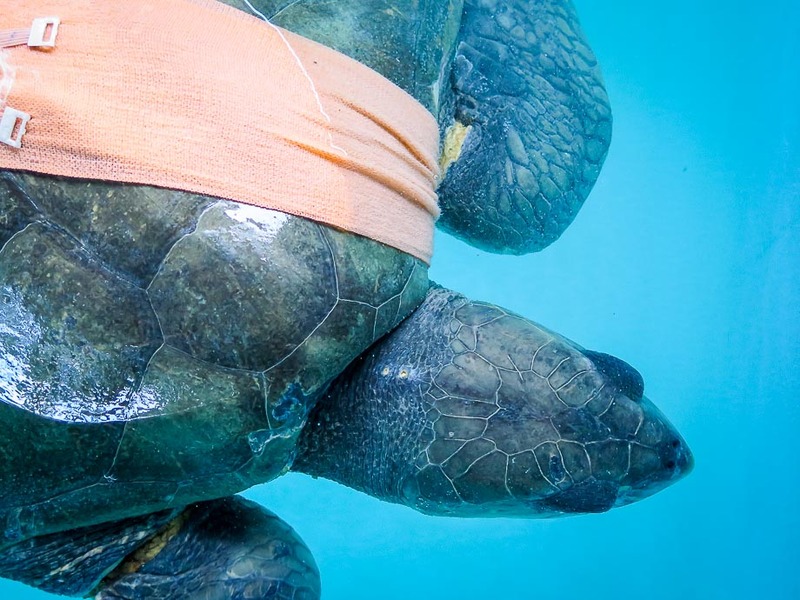 Her remaining rear flipper suffered a deep laceration from net entanglement, and continues to be swollen. Despite these problems, Maria is quite active despite having a poor appetite. Health Report – Receiving a high dose of antibiotics (Amikacin). Daily wound care of amputation site; saline and iodine flush, application of Silveleb, and bandage change. Other wounds cleaned with alcohol swab then Zylo-P/Silveleb applied.